This is a four session class that will cover several different applique techniques. As you learn and practice each technique you will be completing a quilt block. Each class builds on the skills learned in the prior class. Techniques will include: pattern transfer, needle turned applique, bias stems, layered flowers, woven baskets, reverse appliques, rose buds, ruched roses and more! The four finished blocks can be used in a lap quilt, table runner, wall hanging or be the beginning of a full size Baltimore Album Quilt. Patterns provided with class. Please see website for complete listing of all class dates for this class. If you missed the first one, you will enjoy this one! Debbie has some great coasters and a bonus placemat pattern. Pattern included in class fee. Make this stunning table runner in your favorite colorways. 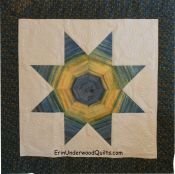 Erin will even supply a bonus placemat pattern with the class to use up your scraps. Come and learn the beginning basics of Paper Piecing with this adorable wall hanging. Pattern included with class fee. 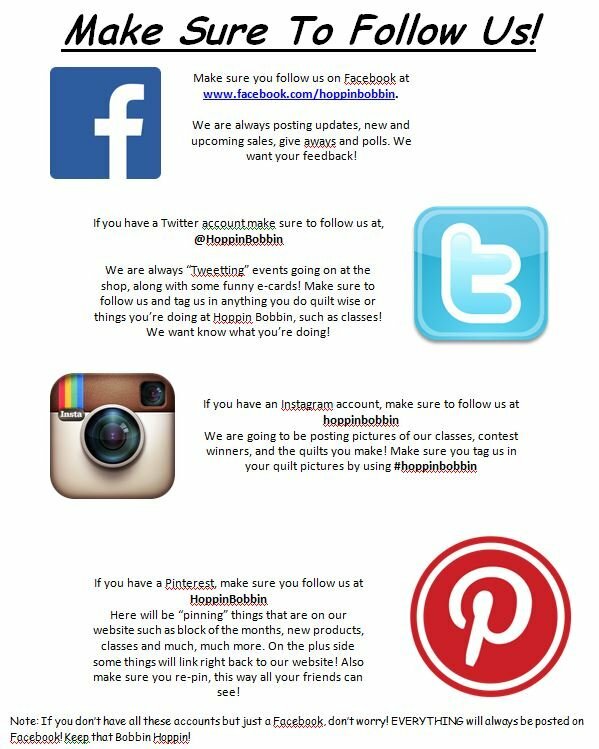 Also make sure that you follow us on all of our new social media sites! Heres how. Jodi Barrows is the creator/owner of the Square in a Square® technique. She has taken her love of quilting and combined it with her love for the Old West. During this time, you'll hear the history of the Pony Express and hear stories about her unique family of women. Come see the quilts and listen to Jodi as she makes this pre-Civil War time period come to life. You'll see an overview of her amazing Square in a Square technique for piecing a quilt. You'll be amazed at how versatile the system can be for any quilt design you use. We are so excited about her visit to our shop. Please plan to attend - you'll be glad you did. I am really excited about this event! I hope that you will all join us. We have limited seating so please sign up early! So, until we see you again, keep those bobbins hoppin!